The Bike 2001 was formulated by a handful of key Campaign members, following a request from councillors for an analysis of the problems encountered by cyclists, and a structured report which presented recommendations on how the council could address the issues arising. 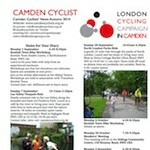 Bike 2001 was presented to Camden Council in October 1997. The Council started work on its Camden Cycle Plan in 1999, which drew heavily upon this document.